Hi! -- if we don't have the nights you want, please check out our other listing VRBO 138474. It's on the same piece of land and has a separate entrance, larger fenced yard, awesome view, and a dishwasher!! The casita (this listing) is located on a high ridge between Taos and Ski Valley on the Valdez Rim Road with a spectacular view of the Valdez Valley. 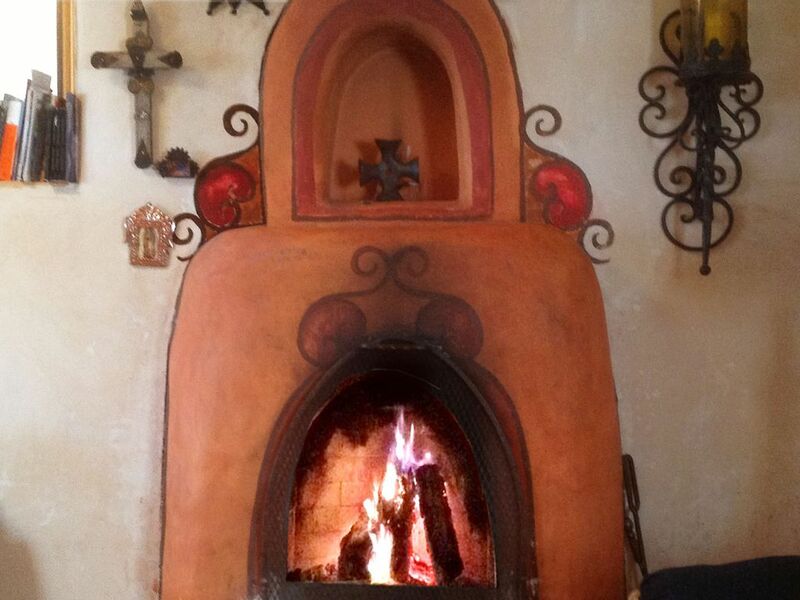 An authentic old adobe casita, it's serene, quiet and private. Only 15 beautiful minutes up the mountain to the ski lift, five minutes to the charming town of Arroyo Seco with great restaurants and shops, and a lovely 20-minute drive back to town! Our check-in time is 3:00, checkout is 11:00 -- we know you'll hate to leave! Pets: The casita has a private entrance and separate fenced yard -- we welcome one or two good dogs. *(see note). Sorry, no cats (our good dog will eat them). Smoking: There is NO SMOKING in the casita. TO MAKE A RESERVATION: We have a 3-night minimum. We are not often home to answer the phone! Thanks. *dogs must be housebroken, people! No peepads. No pooping in the house! I can't believe I had to say this. Do you like my self-portrait? I'm a former D.C. lobbyist, a sometime artist who drove up the canyon road past the hairpin turn one weathery afternoon, over the top to the view, and into the rest of my life. The old adobes of Taos are very special. Handmade, each one unique, with soft welcoming curves. History, romance, old legends, an historic neighborhood, and astoundiing views. The casita was originally a workshop with a primitive bedroom and bath. It was so much fun creating a unique, special, evocative place to relax and be inspired. Old adobe is magical. The magic rubs off -- you'll see! It's a quiet and peaceful area 20 minutes from the center of town and in the other direction, ski valley. Out of the traffic and noise but close to everything, with restaurants only 5 minutes away! Stunning views across the valley to adjacent mountains, and beautiful sunsets. We have a land line -- you will need a phone card for long distance. Verizon cells kind of work here. private laundry room with w/d. Refrigerator/freezer in kitchen and additional refrigerator in laundry room. We have two covered porches ('portals') at the casita with great views, and a nice fenced yard! Wood burning kiva fireplace, flowers, candles, private Phone/wireless computer access, lots of books, freezer, private fenced yard, private entrance. 5 Museums, more than 85 Art Galleries, great restaurants, historic homes, Taos Pueblo. Beautiful scenery. Great for artists, photographers, writers, poets.